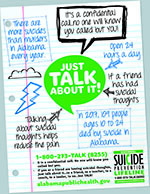 The Alabama Youth Suicide Prevention Program provides suicide prevention materials to persons or agencies with tools to make referrals to the National Suicide Prevention Lifeline or any of the Alabama Crisis Centers for anyone at risk or worried about someone at risk for suicide. 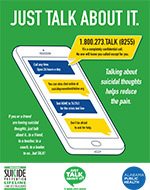 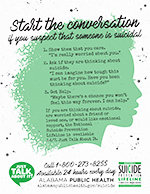 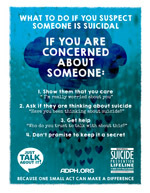 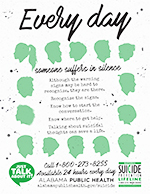 Below are some free materials available from the Alabama Youth Suicide Prevention Program that can be placed throughout schools or agencies in your community to help anyone who is at risk for suicide. 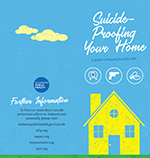 Click on the image to download and print the high-resolution PDFs below, or order these materials by contacting Betsy Cagle at (334) 206-3995 or via email: betsy.cagle@adph.state.al.us. 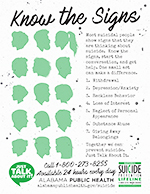 If you or someone you know is in need of immediate help, please call the National Suicide Prevention Lifeline at 1-800-273-TALK ( 1-800-273-8255).